Team Phungo will not be able to make it to the next edition of the Philadelphia Sportscards and Memorabilia Show which is happening this weekend. I have always enjoyed the show and encourage anyone interested in card collecting to attend. Although it appears that the show is becoming more and more an autograph show then a show for card vendors. There is a BIG 1980 Phils Reunion going on for the show with roughly 20 members of the 1980 World Series team scheduled to appear either Saturday or Sunday. The Big Names are all scheduled to be there on at least one of the two days Carlton and Schmidt on Saturday - Pete Rose on Sunday. I tend to think Autos at these shows are a bit pricey - but I think when you stack him up against the rest of the field Steve Carlton at $39 is the best deal of the big names (Roy Halladay is $149). I like Keith Moreland at $12 in the bargain set - I don't think he is really affiliated with the Phils right now and he would be one of the tougher ones to get in person. The complimentary auto with the weekend admissions is from Philadelphia Eagle Trevor Laws. Admission to the Show is $8 - You can usually get $1 off coupons in the weekend Philadelphia Papers. We are through the bulk of the year and most of the baseball products have already been released. Since it is the Big Shopping Day of Black Friday I have the following card shopping related question. And all 5 purchases have to be from different products - for example if you get a Hobby Box of A&G then your blaster has to be from some other product. And what would be your reasoning for picking out the different cards and package types. I doubt many other folks would go this direction, but I think my Hobby Box purchase would be Topps Flagship - I liked the card design and many of the inserts. I suspect Hobby will go to either A&G or Heritage. On Sunday Anthony Lerew tossed a No-Hitter in the Venezuelan Winter League. Lerew is a Phungo Favorite as he is from my hometown and we attended the same the same high school. Lerew pitched well in the minors this season, but has struggled in his major league call ups with both Atlanta previously and Kansas City this season. I believe he is still contracted to the Royals organization and hope that he gets another crack at the major league level. Probably should have never let him go. That's Right Ryno is back in the Phillies Organization as the AAA manager in Lehigh Valley . Hopefully the IronPigs have a meet n greet and there is a chance to get the HOFs auto. The Ryno Card came courtesy of a Nachos Grande Group Break. Coincidentally NG has a new Grouper going on right now - he still had some teams available a day ago. not sure if you can still get in on the actions. I know the Cubs and Chisox were available earlier in the weekend. It has been a tough year for the Cubs and now comes news that they have damaged the Harry Carey statue while in the processing of moving it from one corner of the Wrigley Field neighborhood to another. And of course Harry may be bummed out because somebody misspelled both his first and last names when creating this 2010 Phungo Card. Still I like the card and will hopefully will correct the mistake in a future Phungo release. Who Does a Better Anthem Card? I have been meaning to Post this for a while - Since today is Veteran's Day I thought it might be appropriate. I would have claimed a victory if it were not for my very unfortunate typo of "Nationals" instead of "National". This picture was taken prior to a Yankees Phils game in 2006. The Phils got shutout by stinkin Jaret Wright and a village of relievers that night. At the time We were still less than five years removed from 9/11 - I was thinking that the Yankees and Mets had stood through a couple hundred anthems but it probably would never get monotonous for them. I give myself props for a Picture that includes a flag (although in the distance) rather than a Japanese automaker. 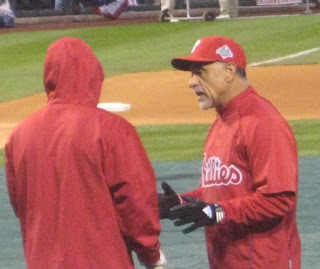 Last week the Phillies announced that they could not come to terms with First Base Coach Davey Lopes on a deal for 2011. I have no idea what the salary of a first base coach is versus a hitting coach. The Philly Inquirer Reported that Lopes said he was not asking hitting coach money - well in my opinion he should of been and to me, he would of been worth it. Lopes turned the Phillies raw players like Shane Victorino into a very efficient base running machine. Perhaps he wore out his welcome with the players in Philadelphia, but the margin for the top teams in the NL East and beyond is very slim. 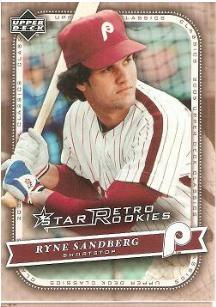 I would hate to see Lopes go to a competing squad and flip what little edge the Phils have. I could see Lopes returning to the Dodgers organization - They are going coaching changes and should be a lot closer to winning then they were in 2010. Lopes working with some of their young talent could be a very helpful. Sparky is of course a Hall of Fame Manager who won the World Series in both leagues and amazingly remains the all-time wins leader both the Reds and Tigers. 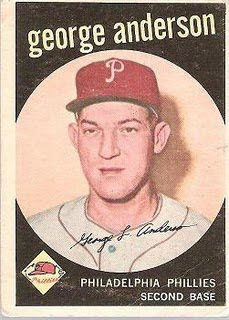 and Yes Sparky played 152 games for the 1959 Phillies. This is his rookie card from the 1959 set. For a further discussion of this card check out the original Phungo posting. Note - the low winner among recently completed ebay Auctions is $12, on the high end a BIN went for $62 within the last 24 hours. Walter Johnson Award winner King Felix on a Phungo Card! I love the idea that baseball bloggers have created their own awards. Last week Collective Troll was good enough to point out that the Walter Johnson Awards for the best Pitcher in the NL and AL were won by the Phillies own Roy Halladay and he Mariners Felix Hernandez respectively. As a Phils fan you may have expected me to have posted Roy Halladay here. But as a lazy person who doesn't purchase many new packs I have yet to procure a Halladay Phils card. Instead I have chosen this opportunity to show the team in the Pacific Northwest some love. This card is from the 2009 Phungo set. The photo was taken during a poor start by Hernandez at the old Yankee Stadium during his disappointing 2008 campaign. The Yankees got to Felix for 6 runs on 12 hits including a dinger by Johnny Damon. As for the card - I mention Hernandez throwing arm as right (RHP) and his card number is 34 - same as his uniform number. However, if Felix gets another Phungo Card in the future he will need to settle for a secondary number as #34 will likely be taken by a different superstar pitcher. If I were to create this card today I would likely note Hernandez as the staff ACE. But back in 2009 that was debatable - and he was actually probably behind Cliff Lee in the Mariners rotation going into 2010. Unfortunately Team Phungo let an ugly typo go through on this card as I have incorrectly named Felix "Feliz"